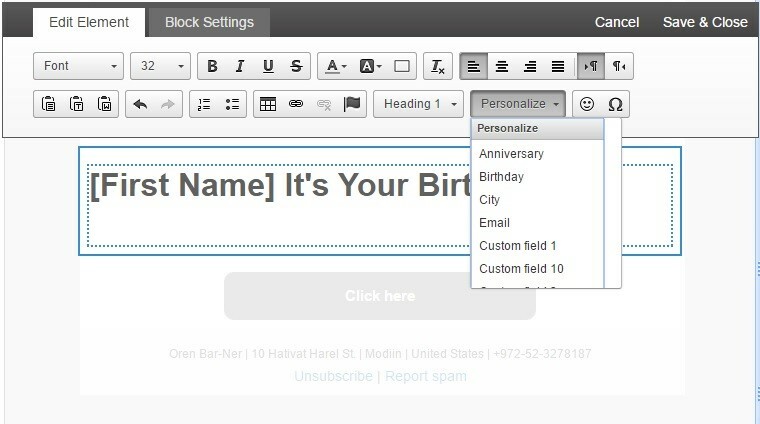 Use ActiveTrail’s personal newsletter customization options to let your readers feel as if the newsletter delivered to their inboxes was written especially for them. 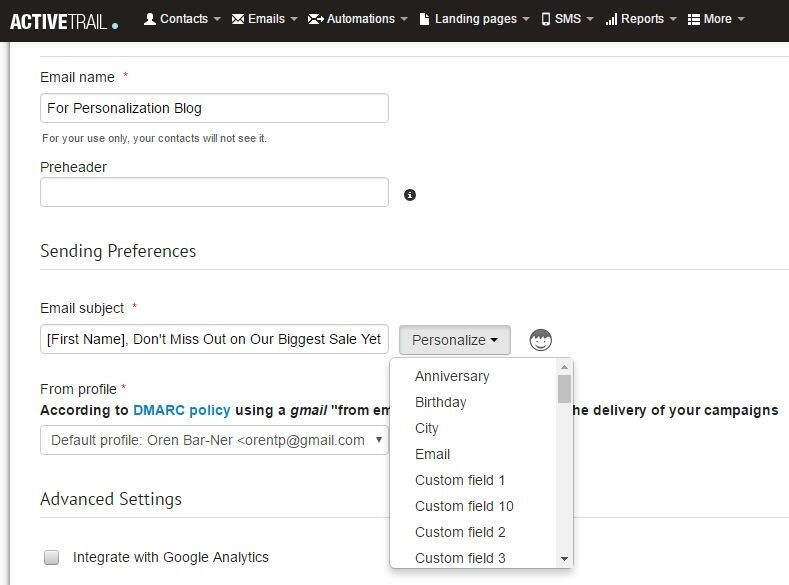 Our personalization tool allows you to easily and dynamically modify your subject lines, content, and even images, for each recipient or group of recipients. Neither programmers nor developers are needed to generate these commands – anyone can personalize their campaigns. Incorporate a recipient’s name, address, city of residence, telephone number and more in the email subject line, and give them the impression that you are addressing them directly. You may ask your subscribers for such details in a registration form to a service or to your website. The contact’s details will be automatically added to the campaign’s subject line, based on the parameters that you select. The personal newsletter reference can be inserted in between the text that you enter, wherever you wish (at the beginning, middle, or end of the sentence). You can create the same type of references in the body of your newsletter, anyplace you choose. Using our personalization tool, you can also customize the images in your newsletters, deciding whether to display them based on a condition that you dictate. 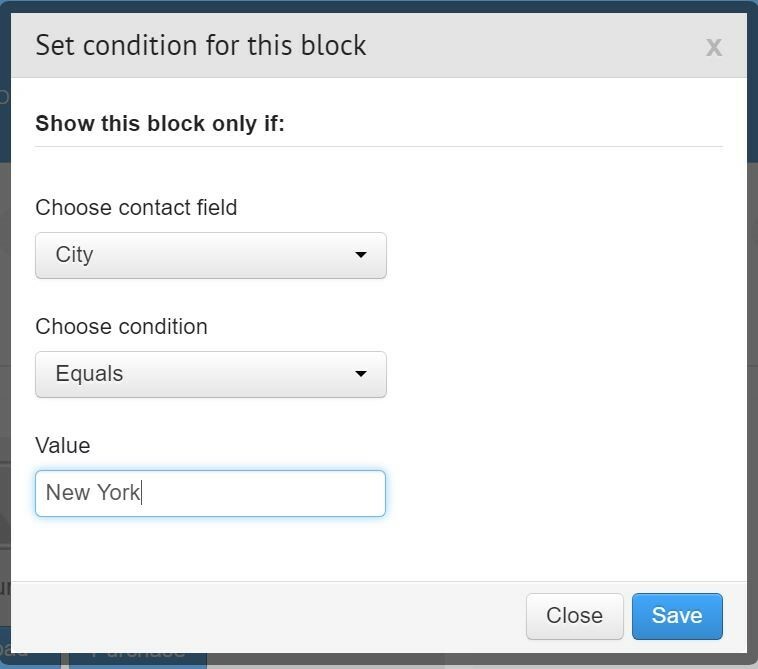 In the system, every image you add to your mailing will display an “if” box that allows you to define conditions for the image block. The conditions may pertain to a person’s name, city of residence, phone and more. You may add a variety of conditions as you see fit. If, for instance, you are marketing municipal services, you can decide that each resident of your state or country will receive a different picture depending on the amenities and attractions available in their city, such that Miami residents will receive images of beaches, New Yorkers will get pictures of the Empire State Building and people from Denver will get snapshots of the Rockies. A Contact Field: for example, “City”. A Condition: in this case “Equals”. A possible value that may be entered, such as “New York”. As soon you save the data and add images that match the various possible values, your campaign will be selectively sent to the contacts who meet the conditions you set. Very important: don’t forget to double check that the information that you are relying upon, actually exists within the system. With the ActiveTrail system, you can split your mailing list into sub-groups, and send them the same campaign with different subject lines. An email’s subject line is the first thing your campaign recipients see, and should, therefore, be well-written, flow smoothly and be inviting. With ActiveTrail, you can adjust your campaign titles to different audiences in your target population, and divide up your recipients based on areas of interest, place of residence, familial status and more. Similar to what we did with images, you may, for instance, partition your mailing list based on cities, where each city has its own, more personal subject, as seen in the following image. With ActiveTrail, creating a number of subjects for the same campaign requires only a few simple steps. All you need to do is to build an email campaign, with one small difference. There are five stages to creating an email campaign in ActiveTrail: (Campaign) Type, Setup, Design, Contacts and Summary. 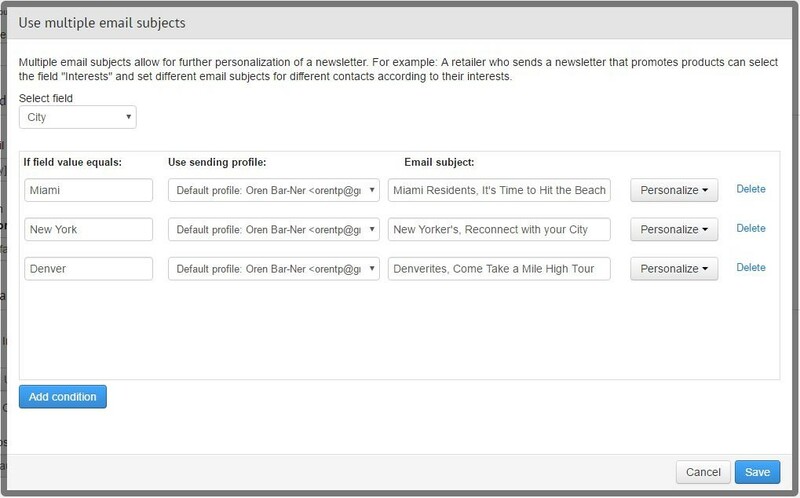 In the second stage, the Setup phase, click on “Use multiple email subjects”, and start to divvy up your mailing list. Groupings can be based on predefined categories such as first name, last name, birthdate, etc., or you can formulate your own categories in the blank fields. Enter a condition value: Just as in the example above “Miami”, “New-York”, “Denver”. 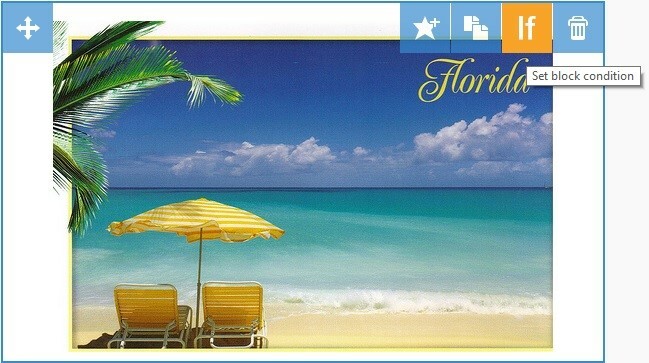 Add a personal salutation: This is an additional personal touch to add to your campaign’s subject line. Moving on to the main body of your email, you can tailor the content of your newsletters to your subscribers, giving them a more personal and interesting reading experience. With the ActiveTrail system, you can add personalized blocks to the body of your newsletter, that will update automatically depending on who the reader is. For instance, you may add a special promotional offer to your monthly newsletter, that will only be presented to the employees of a certain company. By creating a condition within ActiveTrail, you can set the system up so that only recipients who work at the specific company that you defined will be able to see the offer. The rest of the subscribers will see the newsletter without the offer. Your new subscribers will feel that you are addressing them personally, and all that is required from you is three more seconds of work. Interested in learning how to do this yourselves? Start a new campaign, and add all of the necessary details up until the design phase of the campaign. 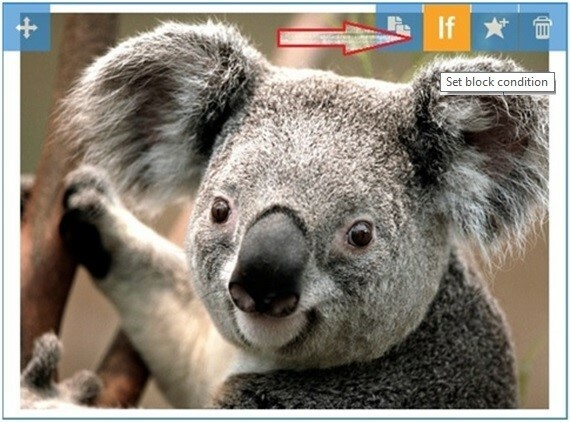 Drag whichever block you wish to personalize onto the campaign (title, image, text, button, etc.). There are a great many ways in which you can apply this feature, but one thing is for sure – it will make your subscribers feel important and will draw them to take the action you want them to. ActiveTrail, finally a system that lets you relate to your subscribers, with little effort, on a personal, familiar basis. Join us today and customize your email marketing content to each and every subscriber.